Valdez began to spell, paused, and restarted – sparking an immediate inquiry by the judges over contest protocol. Satisfied that his pause did not violate National Spelling Bee rules, they awarded him the coveted first-place prize. “I was nervous, but it was fun!” Valdez said. Valdez competed against 11 students from Don Julian Elementary, Sunkist Elementary, Van Wig Elementary, Edgewood Academy and Torch Middle School in the District Spelling Bee held January 24th at Torch Middle School’s Watanabe Center. One competition was held for students in kindergarten through second grade and another for third through eighth grade. 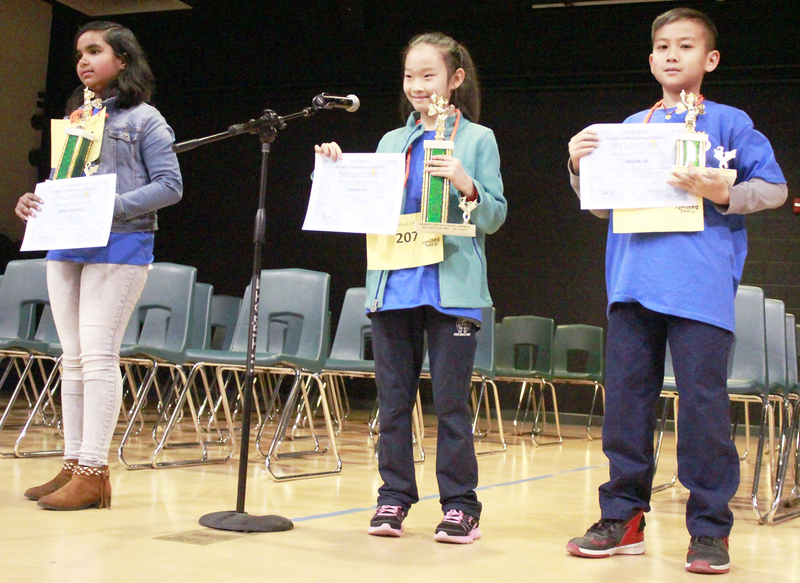 In the second competition, fourth-grader Chelsea Xu took first place after getting to round 28 against two other opponents and spelling “leaflet” for the win. Xu will advance to the Los Angeles County Scripps Regional Spelling Bee at North Hollywood High School on Saturday, March 9th. Xu will be joined by the first-place winners from each Bassett campus Bee held in December. (See lists of winners below.) Students who qualified for the District Spelling Bee were the first, second and third-place winners for their campus Bee. Science Fair Coordinator Belinda Puente, an Early Literacy Specialist at Bassett Unified, said the competition brings out the best in students. 1-24-19_BASSETT_BEE_1: Don Julian Elementary second-grader Joseph Valdez (center), second-grade student Sergio Marquez (right) from Van Wig and first-grade student Riyana Shafeeq (left) from Van Wig receive their trophies and stand alongside their spelling bee competitors for a round of applause. 1-24-19_BASSETT_BEE_2: Fourth-grade student Chelsea Xu from Van Wig (center) and fourth-grade student Edison Lee (right) from Sunkist will move on to the Los Angeles County Scripps Regional Spelling Bee in March. 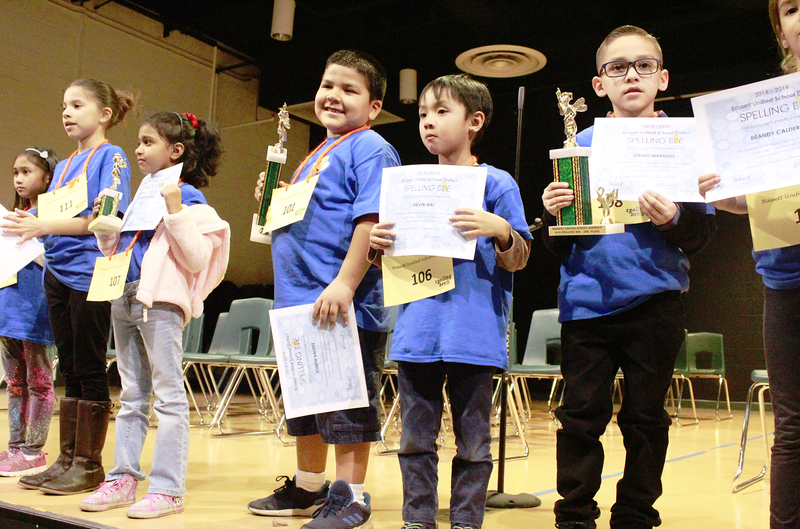 Don Julian Elementary second-grader Joseph Valdez (center), second-grade student Sergio Marquez (right) from Van Wig and first-grade student Riyana Shafeeq (left) from Van Wig receive their trophies and stand alongside their spelling bee competitors for a round of applause. Fourth-grade student Chelsea Xu from Van Wig (center) and fourth-grade student Edison Lee (right) from Sunkist will move on to the Los Angeles County Scripps Regional Spelling Bee in March.